The Church of Scientology of Quebec says its staff are "religious workers" who volunteer their time, but a law professor says that title doesn't exist in Quebec law. Assigned based on a person's role and experience within the organization, the value of these units can fluctuate from week to week depending on how much money the church brings in over that period. On another pay stub seen by Radio-Canada, one of the workers was paid $20.19 for six hours of work. Radio-Canada tried to reach these specific workers for comment, without success. Workers within the organization must also deduct taxes and other contributions, including workers insurance, from their gross salary. The cumulative salary for one staff member was about $8,275 after deductions, according to another document obtained by Radio-Canada. The church has two branches in the province, one in Quebec City and the other in Montreal. The Church of Scientology of Quebec — the official name of the branch in Quebec City — refused Enquête's request for an interview. In an email, however, a spokesperson said the organization doesn't have "employees." 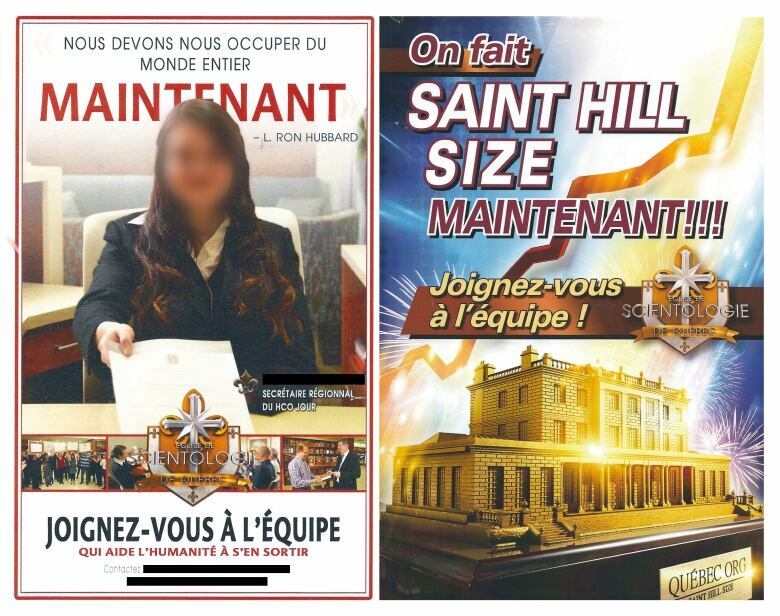 "Church of Scientology of Quebec staff members are not 'employees,' but religious workers," said Michelle Lacombe, the group's director of public affairs. "They voluntarily contribute to the activities of the church and its humanitarian goals. They don't work for monetary gain, but to help others," Lacombe wrote. Lacombe said, however, that "naturally, there is compensation so that staff members can carry out their work." However, the concept of "religious workers" doesn't exist under the province's labour laws, known officially as the Act Respecting Labour Standards, said Dalia Gesualdi-Fecteau, a law professor at the University of Quebec in Montreal who specializes in labour law​. Gesualdi-Fecteau questioned the organization's assertion that its staff are volunteers as understood by the law. Someone can't be a "semi-volunteer," she said. "You're salaried or a volunteer." Even if you're paid a small sum, you're no longer volunteering, Gesualdi-Fecteau explained. "We're seemingly moving away from volunteer work because there are pay stubs, there are sums being deducted," said Gesualdi-Fecteau, who worked as a lawyer with Quebec's labour standards commission for eight years. "It seems to me like a structured way to get cheap labour," she said. 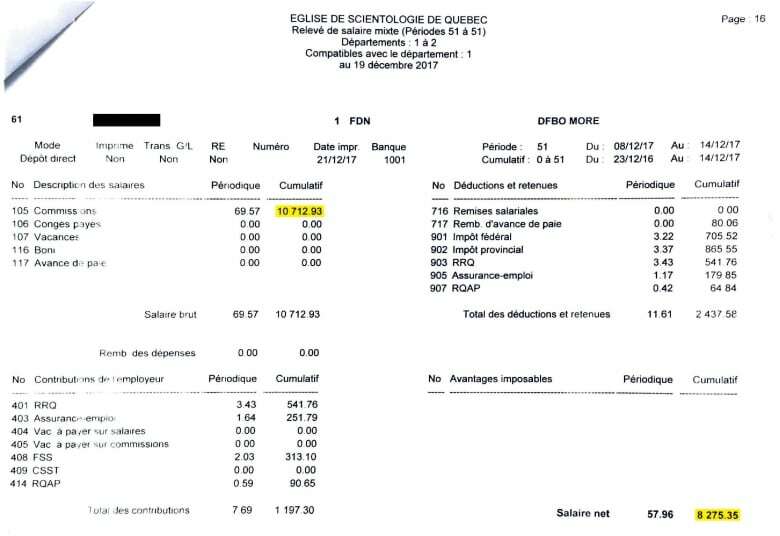 A former spokesperson for the Church of Scientology of Quebec, who held the post in 2010, told the newspaper Le Devoir she was paid between $800 and $1,000 per month for full-time work, which amounted to less than the minimum wage at the time. The organization, which says it has 70 workers in Quebec City, is actively recruiting with the help of advertising. "Since our community is continually growing, the need for new staff members is proportional," Lacombe said. In addition to their wages, the organization's staff benefit from "spiritual services" and "personal improvement courses," Lacombe said. However, law professor Gesualdi-Fecteau said that can't replace a proper salary. While some types of workers are totally or partially excluded from Quebec's Act Respecting Labour Standards, those exemptions would not apply to the Church of Scientology of Quebec, said Gesualdi-Fecteau. Individuals who are self-employed, employees subject to the Canada Labour Code, embassy or consulate employees, senior managerial staff, or a student who works as part of an internship program approved by the Quebec Education Ministry are among the types of workers who may be excluded, according to Quebec's workplace health and safety board. 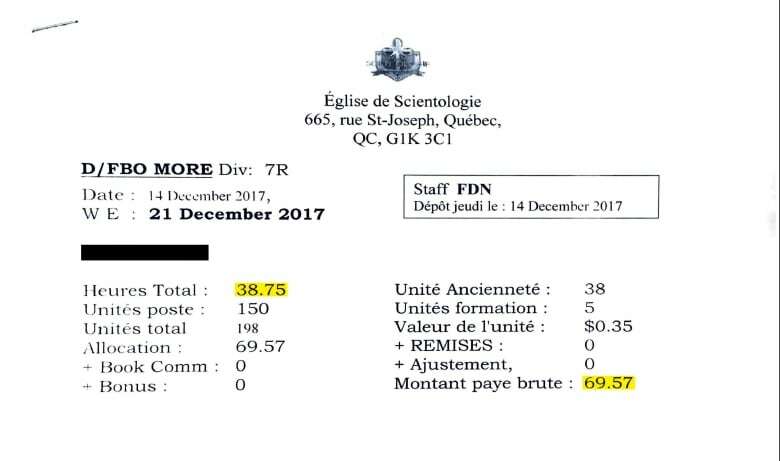 "I can't manage to find an exemption that would justify [the Church of Scientology of Quebec] paying less than minimum wage," Gesualdi-Fecteau said. "A person who is not subject to an exemption [under the law and] who doesn't appear to be a volunteer, has the right to the minimum wage. [If not], we're violating the Act Respecting Labour Standards. There's no other way to say it." For several years, former members of the Church of Scientology, which operates in countries around the world, have talked about being poorly paid by the organization. They were paid less than the minimum wage in their respective countries, they said. Jean-Paul Dubreuil, a former Scientologist in Quebec who left the church in 1990 after more than six years, said members were paid depending on what they could bring in to the organization. "If the group didn't make a dime, we weren't paid," Dubreuil said. He said a local office of the church had to pay its bills and allocate part of its profits to the organization's central branch, similar to a franchisee, before it could pay its staff. Dubreuil, who has a critical, personal opinion of the church's labour practices, said he believes they amount to "slavery, pure and simple." "But slavery carried out in a joyous way because we're saving the world," said Dubreuil, the author of the book, Les coulisses de la scientologie, and one of the few people in Quebec who has made some of the group's inner workings public. Ludovic Durand, another a former Scientologist who worked at the Celebrity Centre in Paris for 20 years, said he didn't initially think about working conditions within the organization, but later became disenchanted, largely because of the low salaries. "It's clearly not volunteerism. It's never been volunteerism," Durand said. "That's the facade."